just up the pike: this community landmark just became a chain store. why? this community landmark just became a chain store. why? For over a decade, Pyramid Atlantic was a Silver Spring landmark, offering studio space, art classes, and a gallery that hosted events and concerts. Now, its bright red building on Georgia Avenue is a chain paint store. Pyramid Atlantic opened in 2003 and helped to usher in downtown Silver Spring's revitalization over the past decade. 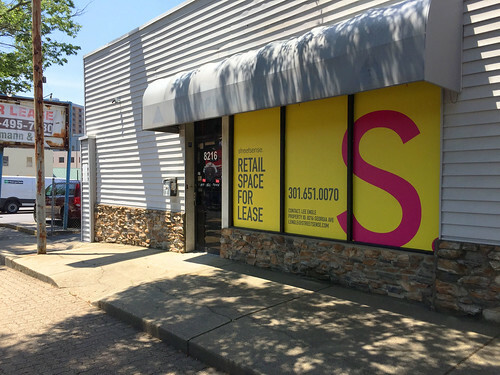 They sold their building in 2014 anticipating a move to the new Silver Spring Library a few blocks away; when that arrangement fell through, the organization moved to Hyattsville last year. 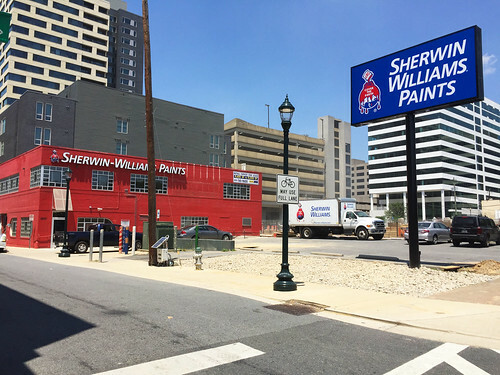 The building's new owner, Harvey Maisel, rented the space to paint store Sherwin-Williams, which will open this summer. I can't help but be disappointed by this. Over the past several years, I've gone to lots of events at Pyramid Atlantic, from the DC area's only PechaKucha Night to a pop-up version of Fenton Street Market. Pyramid Atlantic also hosted the annual Sonic Circuits festival, a celebration of experimental music that spilled out into its parking lot on Georgia Avenue. It wasn't just a place to see cool things, but a supporter of the local economy: a locally-based organization promoting local artists and businesses. And besides, one might wonder why a paint store makes sense here, considering that the existing paint store across the street is closing. So why did this happen? There are a few reasons. Federal tax laws let commercial property owners depreciate the value of their buildings over time, which can give them a perverse incentive to let a space sit empty for years until they find the right tenant. There are number of vacant storefronts in downtown Silver Spring, sometimes filling entire blocks. The Guardian Building, a 1950s-era office building on Cameron Street, put up fake store signs in their windows while they waited for actual stores to move in, and now the building may be turned into apartments instead. As Richard Layman notes, retail rents in DC (and by extension Silver Spring) tend to be pretty high, even in neighborhood shopping streets. Large out-of-town retail developers perceive DC as being part of a national or even international real estate market and set their rents accordingly, That leads even local property owners to raise their rents as well, which in turn makes it even more difficult for independent retailers to qualify, so they either close or don't open at all. And of course, the landlord just needs someone who will pay the rent. I know that from experience. Among the many things I do, I do property management, and have to find and screen tenants for rental houses. When I'm renting out a house, I meet lots of really nice people, who tell me how much they love the house and the neighborhood, and promise to be great tenants. Most of them seem like awesome people. But when it came to a decision, I select tenants based on a few criteria: their credit score, their annual income, and a background check. I need someone who would pay the rent. Property owners and landlords are much the same, whether they're locally-based or from out of town. They may have different individual motivations, but they all want somebody who will pay the rent each month on time and in full. I have friends who own businesses in Silver Spring and they all say the same thing: landlords are very, very reluctant to rent to them. And I've spoken to landlords who've gotten burned by small businesses who for whatever reason couldn't pay the rent. They want tenants with a long track record and a guaranteed stream of income. More often than not, that means a chain. That's part of the reason why a number of Silver Spring's most-loved local businesses have been replaced by chains. Mayorga Coffee, which helped revive South Silver Spring fifteen years ago, is now Davita, a dialysis clinic. Beloved Italian restaurant Da Marco is now a Pollo Campero. And Pyramid Atlantic will become a Sherwin Williams. There's a demonstrated difference in the way chain stores and local businesses contribute to their local economies. One sends money out of town. The other keeps it in town; creates a spinoff effect as that business works with local vendors and suppliers; builds local wealth; and can help create or boost a local culture. We have a real incentive to promote local businesses on our streets. Given all this, what can we as community members do? We can't ban national companies from owning property here. We can't tell property managers who to rent to. Local governments can zone properties for certain activities but they can't dictate whether, say, a chain or a local business occupies a certain space. I don't know enough about tax laws to know what can or can't be done there. But as a start, we can support the local businesses that do exist by spending money there, which makes it easier for them to pay their rent, which in turn makes them more viable candidates for landlords. That won't bring Pyramid Atlantic back, but it will help us keep the local businesses that are still here, supporting and promoting this community.